Article by Ryan Miloshewski ~~ The 2005 Bassmaster Classic in Pittsburgh, Pennsylvania was one of the toughest in history. With only 11 fish and a measly 12 pound 15-ounce weight, Kevin Van Dam pulled off his second Classic victory. The key? Being able to adapt and change to the conditions. Other anglers were catching fish, but hardly any keepers. Van Dam switched to a classic Smithwick Rogue and boated several keeper smallmouth bass. The one thing makes any person truly successful is being able to adjust when conditions change. Staying static when everything else around you remain dynamic does not bode well for success. With fishing, anglers tend to rely on techniques and spots that have worked previously. All of us are guilty of it. Southwest Missouri, known as the Tri-Lakes area, has gone through three 100-year floods from 2008-2017. In April 2017, Beaver, Table Rock, and Taneycomo all reached or crested flood stages for a few weeks due to heavy rains. Because of federal laws and practicality, the Southwestern Power Administration (SWPA) began releasing 20-50, 000 cubic feet per second (cfs) of water from Tale Rock Lake into Lake Taneycomo. With the floods came a challenge for fishermen on Taneycomo: where were the fish and how do you catch them? The usual hot spots were rendered useless due to the high water. Lake Taneycomo, with four turbines and 10 flood gates open at Table Rock Dam, was raging. Extremely fast and high, some guides were struggling to find clients fish. Fish hold in slower water like eddies and breaks when the current gets heavy. Islands, points, and docks all can prove useful during high water events. In 2017, typical eddies just weren’t holding enough fish. Enter Duane Doty, the dock manager and resident jig-tyer for Lilleys' Landing Resort and Marina on Upper Lake Taneycomo. He knew the fish had to be eating—he just needed to find him. He had an inkling the fish would be holding right on the bottom of the lake, where the current was, presumably, much slower. He was right. Another part of the equation changed during the high water. While the flood gates summoned raging current, it also brought over thousands of threadfin and gizzard shad, creating a buffet for Taneycomo trout and warm water species. Doty developed a technique so simple it’s hard to believe no one else thought of it prior. Targeting the shad influx, he tied on Bomber Fat Free Fingerling Shad crankbaits that dove from 8-12 feet, he threw out near the cable. With flood gates dumping thousands of gallons of water into Taneycomo painting the background, Doty turned the boat sideways and reeled fast to get the bait to reach the bottom. Keeping the crankbait in contact with the rocks, he only went 100 yards before he felt a big tug. 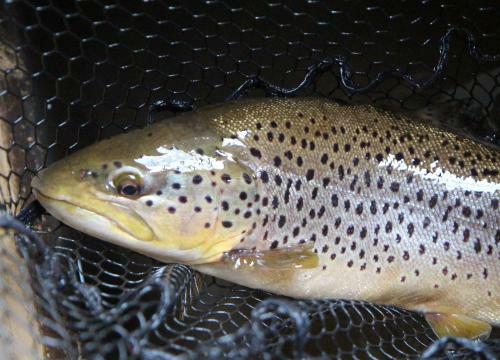 After a battle, he netted his first fish of the day—a shad engorged, 22-inch brown trout. From the cable to Fall Creek, he landed five trout 20-inches or greater on the trip. 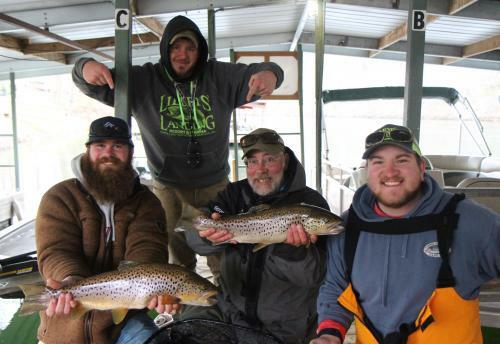 For the next month, Doty and his clients managed to boat numerous trophy browns and rainbows, smallmouth bass up to 5 pounds, largemouth and spotted bass, hefty walleyes, white bass, and crappie on the technique. Others were struggling to simply catch fish, while Doty was putting his clients on big ones daily. In late March 2018, heavy rains returned to the Tri-Lakes area. With one turbine out of commission, and maybe some preemptive thought, the SWPA opened the flood gates for the second straight year. I called Doty and scheduled a trip for Easter weekend. His high school friend’s sons, Blake and Dillon Harris, were headed down as well. We knew what to do. Dragging crankbaits from the cable all the way to Fall Creek, in 24 hours we landed 10 browns from 18 ½-inches up to 23 ¾-inches, as well as several fat rainbows from 17-19 ½-inches. The top locations were behind Lookout Island all the way through the Narrows. Multiple fish came from the seam in the Narrows, including Blake Harris’ 6-pound lunker. Dillon hooked into his 23 ¾ inch 5.6-pound brown just as the bend started by Point Royale past Lookout Island. Being able to adjust to changing conditions put big fish in the boat for us. With more rain sure to come this spring and the possibility of high water, be sure to add this technique to your arsenal on Lake Taneycomo. 1. 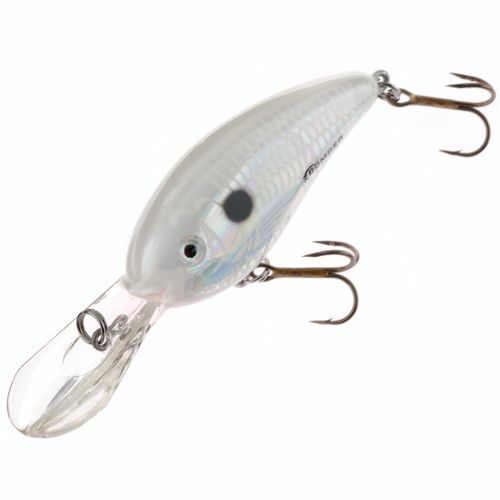 Be prepared to lose crankbaits. We lost six in a three-hour period. With the lure constantly bumping the bottom, it is inevitable. 2. Boat control is of utmost importance with this tactic. Keeping the boat sideways and flowing nicely with the current keeps the bait on the bottom and in the strike zone. 3. An East wind will make this tactic extremely hard because it pushes against the current you are riding. 4. This tactic will only be possible from the cable to Short Creek. Once you get to Short Creek, you lose the stronger current and the crankbaits struggle to reach the bottom and keep in contact with it. 5. We use a 6-foot, medium heavy spinning rod with 6-pound line. You could use a baitcasting rod and reel, sure, but I think the spinning rod gives you more control and leeway when a big fish hits. Being able to backreel on a big brown in heavy current is key. 6. You may struggle with identifying a bite at first—until you get one. It’s unmistakable. But, as Duane says, jerks are free! Don’t be afraid to set the hook if the bait stops vibrating or if slack gets in your line. 7. Check your lure for moss and other debris every couple of minutes, especially in the first mile from the cable. There’s a lot of junk up there.